I must admit to being a bit surprised by these figures. A few weeks back I reviewed a series of Gainax Toricolle figures, and then whilst in Japan I bought boxed figures with exactly the same name but found that they were a different range. 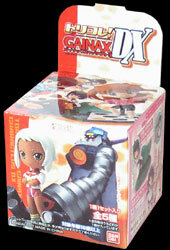 Each gashapon pod in the first range contained just a single figure, but in this one each box contains additional accessories and characters. The figures are 'blind boxed' so you don't know which one each box will contain, and the range consists of Shinji and Asuka from Neon Genesis Evangelion, Mahoro and Silpheed from Mahoromatic, Izumi and Pochi from He Is My Master, Lal'C Melk Mal and Dix-Neuf from Gunbuster 2 and a transformable model of the multi-purpose vehicle Gratan from Nadia, The Secret of Blue Water. These figures are even better than the first range, you get a lot more with each one for starters. Shinji and Asuka come together in one box and each of them comes with a stand based around their synchronisation training from the Evangelion series. Mahoro comes with a alternative head and the Silpheed vehicle which can be attached as a jet pack, or left off. Izumi comes with a special stand which depicts her running away from the (rather friendly looking) crocodile Pochi. Lal'C Melk Mal comes with a stand in the shape of her mecha Dix-Neuf, depicting her standing on its hand. But probably the most fun is Gratan, the vehicle from Nadia which is at various points in the series transforms into an airship, tank and submarine. The figure comes with a host of accessories allowing you to turn it into any of its forms, with (sadly unmoving) wheels, a gun turret, robot arms, legs, hot-air balloon, ballast tanks, periscope and two types of propellers! It makes for a fun little set, but it must be said that the Gunbuster figure is probably the most impressive, even if there is less customisation possible with it. As with the first range I was really impressed with these. The sculpting and painting is excellent and the figures are really cute and well designed. The only real problem from a UK fan's point of view is that only a couple of the figures are from series available here. However, they all look really good, and it's nice to have options to customise them - you can even swap the heads with other figures in the Toricolle range. As with the previous series, these figures look great and are good fun. In fact, the Toricolle figures are amongst my favourite ranges at the moment, I like the style and design of all of the ones I have seen. Although it's a shame that the Gratan figure doesn't feature any moving parts I still can't recommend these figures highly enough. If you can find them make sure you pick them up. 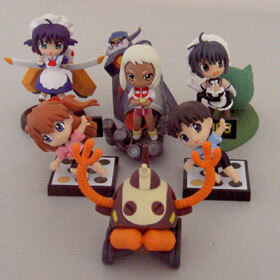 As previously mentioned each figure comes with at least one prop, whether it be the scenery bases of the Lal'C Melk Mal, Shinji/Asuka and Izumi figures or the additional parts with the Gratan and Mahoro figures. It's nice to have options with how the figures are arranged and look, but as mentioned it is a shame that the Gratan figure doesn't have moving wheels, propellers or telescopic legs. However, you can't have everything, and it's still damn good that you get so many additional parts with the figure. A pretty good selection of extras.